Hill explains via email that his stand-alone play, part of a larger theatrical work, examines the concept of “personhood” via the (as yet) fictional secret abduction, torture and elimination of the two greatest threats to U.S. homeland security: Edward Snowden and Julian Assange — portrayed by Vermont-based actors Thomas Hunt and Lauren Chapman, respectively. 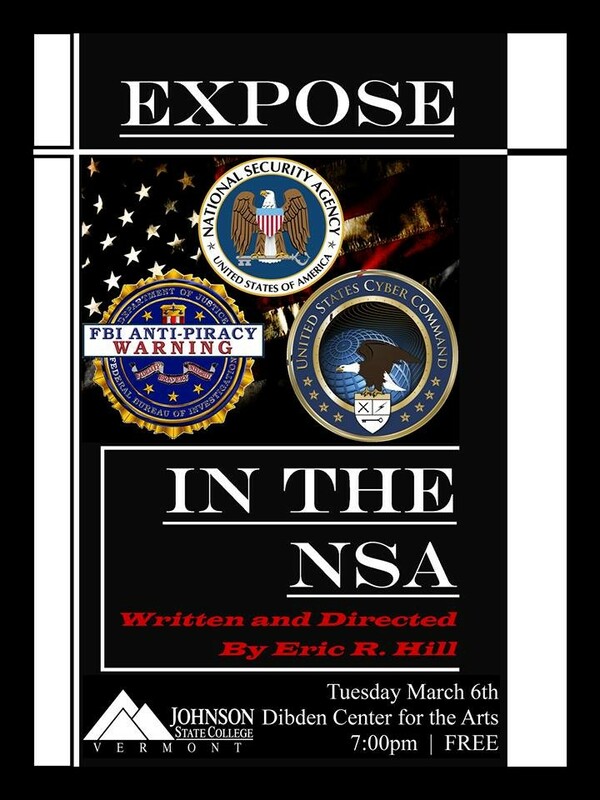 Hill is a 2012 graduate of Johnson State College, where Exposé in the NSA will be performed; the free show starts at 7 p.m. in the Dibden Center for the Arts. He’s written, published, produced and directed three other plays, a full-length musical, and a theatrical adaptation of Jane Yolen's novel The Devil's Arithmetic. Exposé in the NSA debuted at the Champlain Mini-Makers Faire in September 2013. It’s since been “refined and polished” based on audience feedback from that performance — and will be further revised based on feedback from the JSC production. Hill describes this production as a "live workshop." Unlike, say, the recent Kronos Quartet performance at Burlington’s Flynn Center for the Performing Arts, Hill actively encourages audience members to bring — and use — their smartphones during the performance to tweet, Instagram and otherwise socially comment their feelings, ideas and musings live at #ExposeInTheNSA. Hill and his cast will then host an audience Q&A afterward, based in part on those comments. As for assurances that the NSA will not be listening in on that online dialog, Hill makes none.